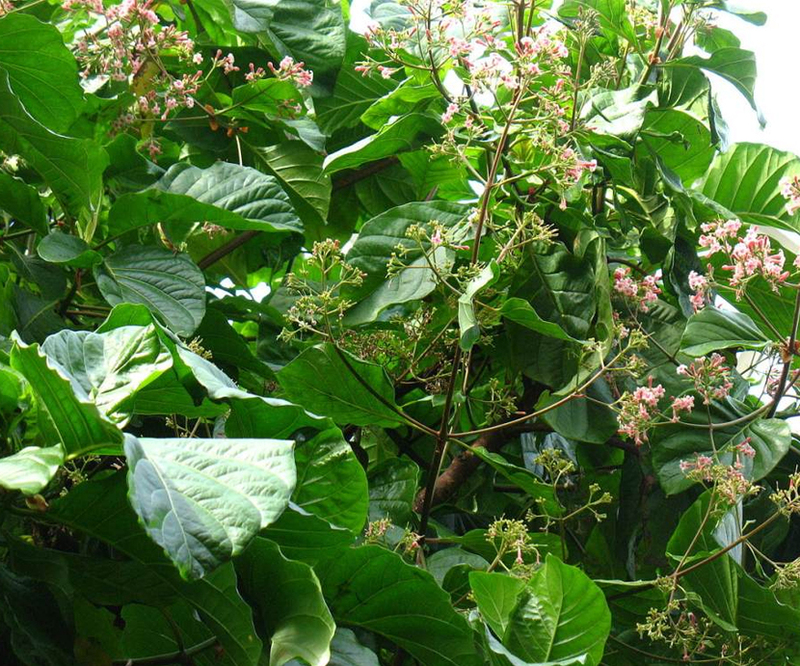 The bark is obtained from the Cinchona Calisaya, Cinchona Condaminea, Cinchona Succirubra, and Cinchona Lancifolia. These trees are all evergreen trees or shrubs. Their generic character is to have opposite entire leaves; flowers white, or usually roseate or purplish, and very fragrant; calyx a turbinated tube; corolla salver-shaped; stamens, five; anthers, linear; style, simple; stigma, bifid. The fruit a capsule, ovate or oblong, filled with numerous winged seeds. About thirteen varieties of cinchona are known to commerce, but the above are the most important. Of these species the former three yield respectively the pale, yellow, and red cinchona barks, and the fourth is one of the sources of quinine. Cinchona chahuarguera Pav. ex DC. Cinchona condaminea var. chahuarguera Pav. ex DC. Cinchona condaminea var. lanceolata Lamb. Cinchona condaminea var. lanceolata Wedd. Cinchona condaminea var. vera Wedd. Cinchona cucumifolia Pav. ex Lamb. Cinchona lanceolata Ruiz & Pav. Cinchona lancifolia var. nitida Roem. & Schult. Cinchona lucumaefolia Pav. ex DC. Cinchona lucumifolia Pavon ex DC. Cinchona macrocalyx Pav. ex DC. Cinchona macrocalyx var. lucumifolia Pavón ex DC. Cinchona nitida Ruiz & Pav. Cinchona obtusifolia Pav. ex DC. Cinchona pubescens var. heterophylla Pav. ex DC. Cinchona stupea Pav. ex Lamb. Cinchona uritusinga Pav. ex DC.